My cousin is a wonderful and innovative cook. Having lived in many parts of India and also in other countries her cooking has been influenced by various cultures. 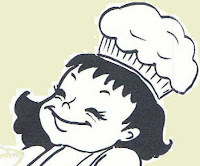 I am amazed by her talent of turning out the traditional dishes into mouth watering hybrid recipes. 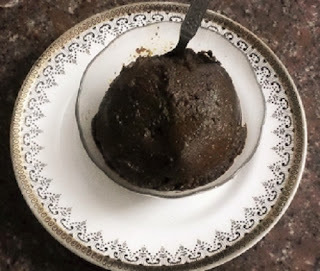 I am posting her 'No cooking, no oil' Tondekai Sasive Uppinakayi / Kovakkai Kadugu Oorugai recipe here after trying it out myself. 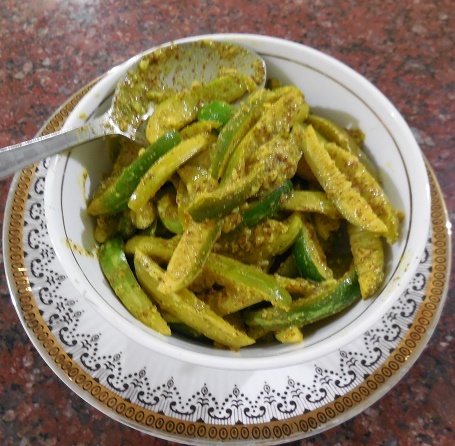 The tangy and crunchy pickle with the pungent flavour of the mustard is something out of this world! 1. Wash the Tondekai/ Kovakkai thoroughly, drain and dry with a cloth. 2. Chop the dried Tondekais/Kovakkai into thin slivers. 3. Add turmeric powder, asafoetida powder, salt and the juice of one lime to the Tondekai/Kovakkai slivers and mix well. 4. Cover and keep it overnight to marinate. 5. Grind the mustard seeds into a slightly coarse or smooth powder in a blender. 6. Chop and add the green chillies and run the mixer again. 7. Add the juice of the second lime and blend into a paste. 8. 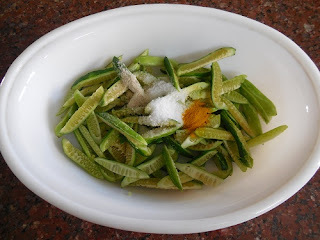 Add the mustard and green chilly paste to the marinated Tondekai/Kovakkai and mix well. 9. Store the pickle in a clean and dry jar. This is a fresh pickle with a CRUNCH and a PUNCH which can be enjoyed with any meal. 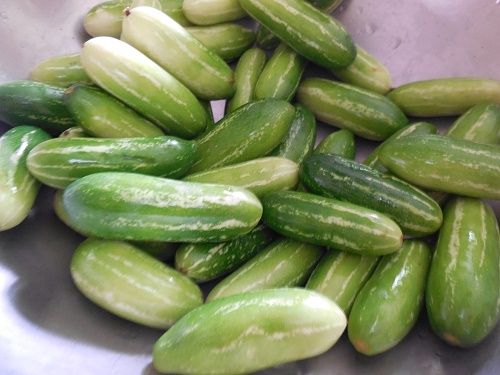 The crisp Ivy Gourd pickle stays good up to one week under refrigeration. 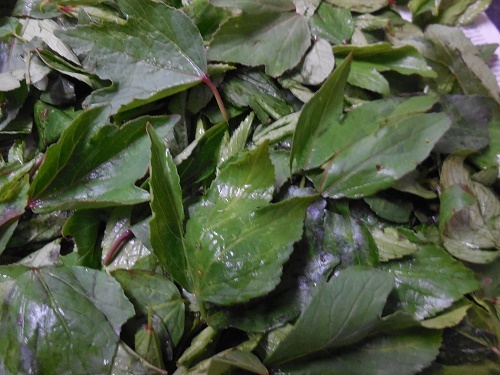 One fine morning I was thrilled when my maid brought two big bundles of the much sought after Gongura leaves( Pulicha keerai in Tamil and Pundi Soppu in Kannada). 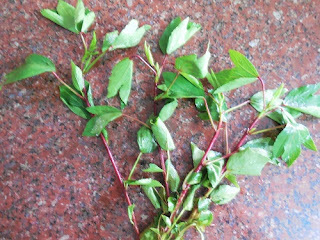 Gongura chutney or tokku as we call it, is my family's favourite. My soppu man who brings all varieties of soppu (greens) to our doorstep never seems to have space for the deliciously tangy leaves in his push cart! 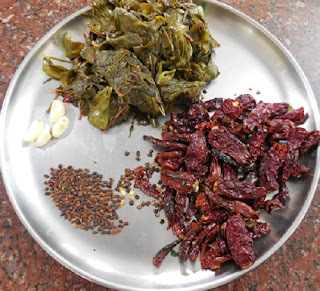 Now that my maid had brought our much treasured Gongura leaves I jumped into action so that we could relish our favourite Gongura Tokku with our lunch. My sister-in-law who happened to be here on her business trip loved the tokku very much and she was very happy to share the tangy spicy tokku with her Tupperware friends. I used 15 red chillies since it was the Byadagi variety. If you are using chillies which are more spicy and hot you can reduce the number mentioned. Sesame oil - 2 tbsp + 1 tbp or more if you prefer. 1. Clean, wash and separate the gongura leaves from the stem. Thoroughly wash the leaves again. 2. Spread out the washed leaves on a kitchen towel so that all the water drains away. 3. Dry roast the fenugreek seeds till they become almost dark in colour emanating a very pleasant aroma. 4. Roast the red chillies in a drop of oil till crisp. 5. Heat one table spoon of oil in a kadai and add the garlic followed by the well drained gongura leaves. 6. Saute till the leaves wilt and become a mass and allow to cool. 7. 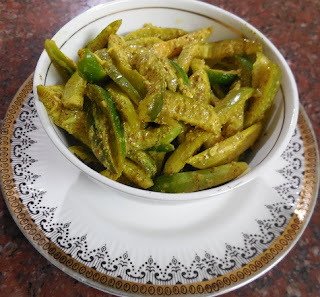 Dry grind the roasted chillies and fenugreek seeds together into a fine powder. 8. Add salt and the sauteed gongura and garlic to the powder and grind into a smooth paste. 9. Heat the remaining oil and add mustard seeds. 10. Add the smoothly ground gongura paste and keep stirring. 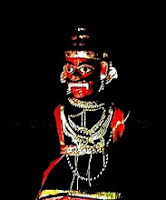 11.The tokku will come together into a ball and you will see traces of oil coming out. Now the spicy and tangy Gongura Tokku is ready. Cool it and store in a clean and dry jar with a lid. Enjoy with steaming hot rice or with dosas, pesrattus and chapaties. The mango tree planted by my mother-in-law's green fingers more than half a century ago is still yielding delicious fruits. The Rasapuri variety is full of sweet 'rasa' (delicious juice) when allowed to ripe naturally. After the raw mangoes were used in pickles and in every day cooking, the family is ready to tackle the ripe ones now. Eating a ripe Rasapuri mango fruit is in itself an enjoyable experience. But who does not love the delicious mango desserts like Mango Halwa, Mango Lassi, Mango Milk Shake, Mango Ice Cream and MANGO ICE CANDY! 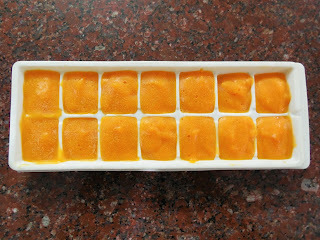 With a sudden spurt of inspiration I set the much loved 'long time no eat' Mango Fruit Ice Candy in an ice cube tray. 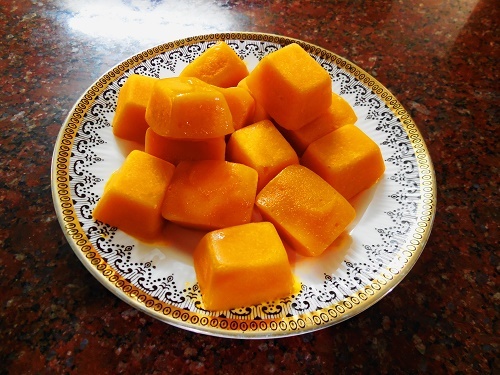 I used only the sweet and fresh 'rasa' of the Rasapuri mangoes to make the ice candy. 1. Peel and squeeze out the pulp and juice of the mangoes. 2. Blend the pulp and juice in a mixer till smooth. 3. 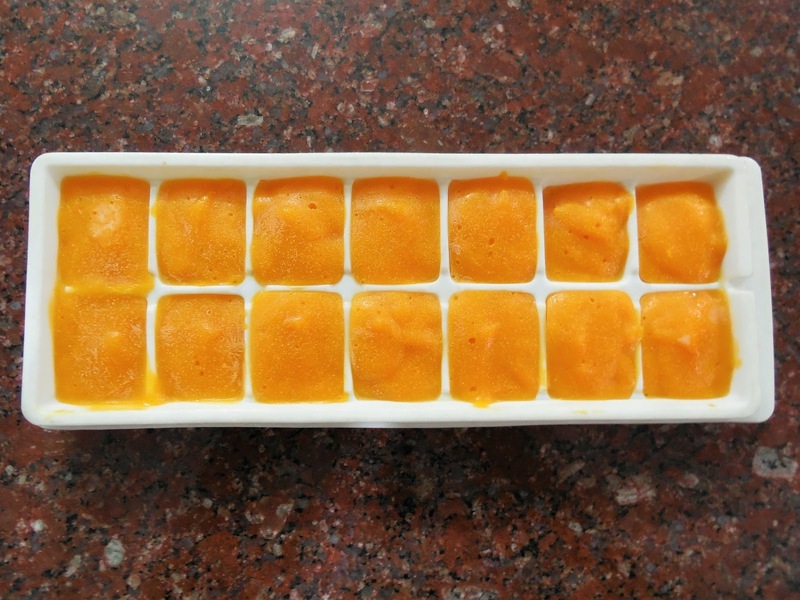 Spoon the smooth mango blend into each compartment of a pliable plastic ice tray. 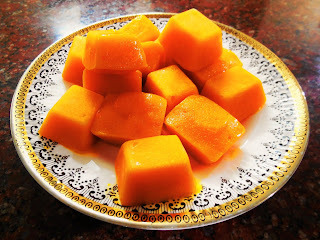 Mango Fruit Ice Candies which jumped out onto a plate! They picked up the candies one by one and popped them into their mouths and were elated as the sweet chilled fruit cubes rolled on their tongues melting away in their mouths! 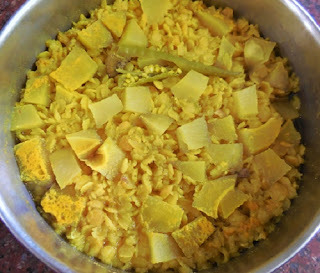 It is customary to savour at least three morsels of steamed rice mashed with plain dal (known as Kalathu Paruppu in Tamil/ Tovve in Kannada) and ghee at the beginning of a meal. Paruppu Sadam (dal and rice) is a simple comfort food which can be relished with any spicy vegetable curry. Adding a squeeze of lime juice, chopped coriander leaves and seasoning to the paruppu makes the Kalathu Paruppu/Tovve more tasty. Manga Paruppu/ Mavinakayi Tovve is a family favourite prepared quite often through out the Mango season. 1. 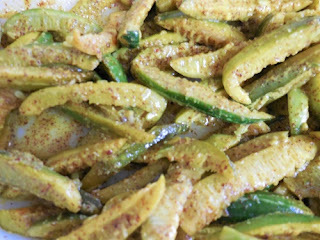 Pressure cook the dals with chopped mango pieces, slit green chilly and turmeric powder adding 2 cups of water until three whistles. 2. When the pressure subsides remove the cooked dal and mash the dal and cooked mango pieces together using the back of a ladle. 3. Add salt and cook the dal on the stove adding little more water so that the Manga Paruppu / Mavina Kayi Tovve gets a porridge like consistency. 4. Heat ghee/oil and add the mustard seeds. 5. 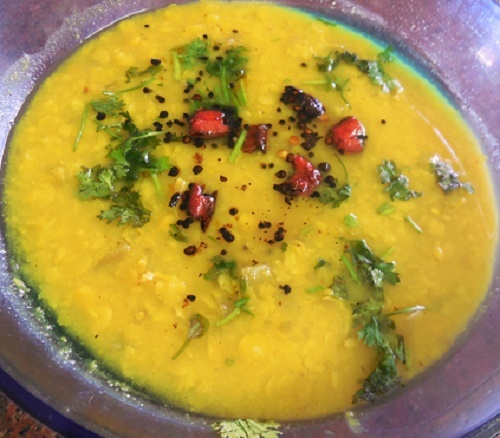 When the mustard seeds splutter add the broken red chillies followed by asafoetida, and pour the seasoning over the Mango dal. Garnish with chopped coriander leaves and enjoy the tangy and flavoursome Manga Paruppu / Mavinakayi Tovve with steaming hot rice and a spoon of ghee.